SETD8 is a critical mediator of MB cell growth. (A) Western blot showing SETD8 and actin from stably transduced shNull or shSETD8 D458 and D425 cells. See also Supplemental Figure 2. (B) Methylcellulose assay with D458, D425, and D283 shNull. Representative images are shown. Line and whisker plots represent the mean ± SD from 3 independent replicates. **P < 0.01; ***P < 0.001; ****P < 0.0001; One-way Anova Dunnett’s test and unpaired t test. See also Supplemental Figure 2. (C) Proliferation of D458 and D425 shNull or shSETD8 neurospheres expressing a NucRed fluorescence marker. The mean red fluorescence ± SD vs. time. 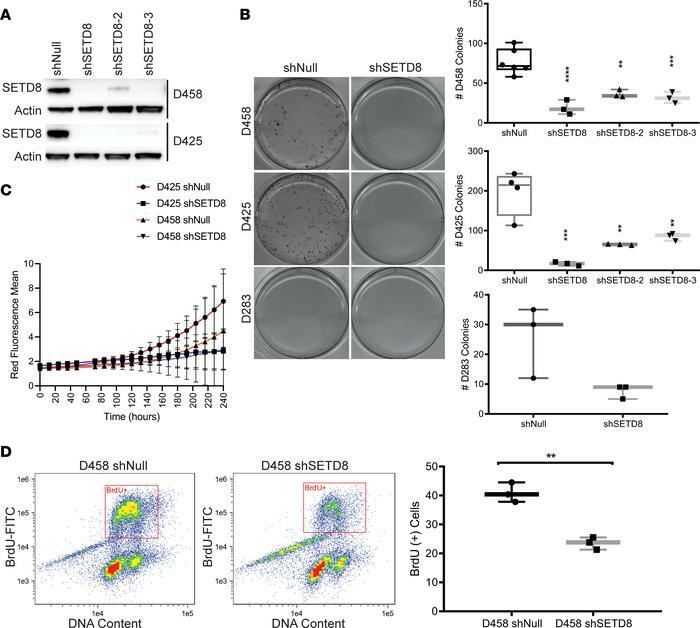 (D) Flow cytometry analysis of cell proliferation by FITC-conjugated BrdU labeling of actively dividing D458 shNull and D458 shSETD8 cells, costained with 7-AAD. Line and whisker plots represent the mean ± SD from 3 independent replicates. Unpaired t test, **P < 0.01. See also Supplemental Figure 2.